All right! I bet you all noticed in the last dev video that colonies seemed woefully empty. Let's help Mr. Parnell rectify that, shall we? Welcome to another brainstorming thread. Like my old planets thread, this thread is supposed to inspire Mr. Parnell to deliver great things with how his procedurally-generated cities look. It should be picture-heavy! Only post what you want to see in the game - post your thoughts on what could or could not make it in, post your thoughts on how things would be procedurally generated. Our coding wizard can manage a lot, but he's not quite a god, and polygons have to be taken into account. So, as far as I can tell, there are a few things that could determine what your city would look like (realistically). I know not all of them will make it in, but... Just thoughts. The civilization - Tweaks shape/color/placement/quantity of buildings the same way that ships would be tweaked. Standard deviation on city appearance: Just determining what "style" of city it should be, could be totally random and based on a seed. Covers everything bizarre and awesome. That allows for pretty much anything. SO! Pictures! Post some of your own to show what you think is awesome. Make sure to note what you like about each image, and draw attention to specific details if you want. I love the multi-level design here, and tiered walkways have always been something I enjoyed looking at. Those chemical plants in the background look pretty wicked awesome, too. I'd love to see Josh generate something to make swirling patterns through windows like that. This one is supposedly supposed to be completely underwater. While I don't like that idea, I love the idea of buildings rising past the top of the screen, with a dense fog in between them - maybe even having the ground not be visible, either. This would be a ridiculously large city, but gorgeous. And those greebles are awesome. Love the sky-walkways between the buildings in the background, and the drainpipes at left. Also really like the cleaning vehicle in the background - that looks pretty awesome, and I'd love to see something like that. In fact, coming across an old, dying colony where half the city is abandoned and maintained by that sort of robot would be just amazing. It seems to me this central design would be pretty easy for Josh to make - and I love the landing pads and cylindrical outcroppings - as well as the long stretch of enclosed walkway in the foreground. Looks a bit topheavy, though. 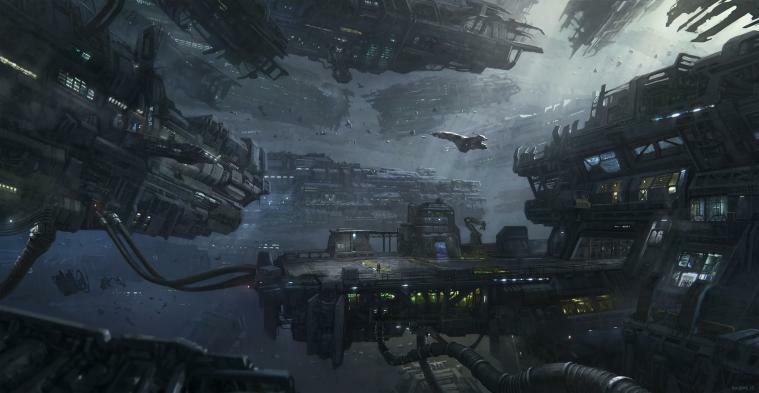 I think this might be Star Citizen concept art, but I love the way it looks like everything is shattered after the battle. And Josh should really consider volumetric fog, at least on occasion. Weather in cities ought to be awesome too... and for this reason alone I'd love to see planets rotate. Getting to see your colony at night would be amazing... but I guess probably a bit hard to render with lights everywhere... oh well. All the same, I'd love to see shadows cast from the taller buildings. Greebles seem to be the order of the day, as far as what I like. He shouldn't have any trouble with that - he does just fine with putting them on his current ships. I don't expect it to be this pretty - I'm just trying to give Josh some inspiration, show him what we like, and keep him from having to search everywhere for pictures. Also helps if we can give him generation ideas at the same time. Last edited by Talvieno on Thu Jul 03, 2014 5:35 pm, edited 1 time in total. Take a look at the left side of the secret science ship from Update #17, five minutes in. It could be a clever combination of textures and lighting, but it sure looks like it. Looking at the rest of the ships i dont think that there is greeble at the moment. Cornflakes_91 wrote: Looking at the rest of the ships i dont think that there is greeble at the moment. Hmm, true enough. Ah well, the texturing is spectacular. Or at least good enough for what we need. Side note: is Josh making any functional distinction between "colony" and "city?" I imagine a colony as a relatively small number of people artificially planted on a new world and working toward self-sufficiency, while a city is a stable collection of a large (possibly extremely large) number of people. Economically, colonies would tend to be purchasers of basic needs and producers of raw or minimally processed resources, while cities would tend to be consumers of basic resources (especially foods and power sources) and both producers and consumers of novelty/entertainment and information resources. This would make it useful to be able to distinguish from space whether a settlement is a colony or a city. OK, then: is every settlement in LT really a colony under the above definition? If not, then (and here's where I say hello to the actual topic of this thread) I'd like to see colonies and cities as visually distinct from each other, both from space as icons and on the ground as buildings. can we just say cloud city on bespin? don't underestimate the older ideas, they became famous for a reason. Flatfingers wrote: Side note: is Josh making any functional distinction between "colony" and "city?" I've been wondering the same thing myself, Flat, after viewing all this thrilling concept art on display here. I'd ask, but my missive would probably just end up in the pile of unanswered questions. I'm doubtful if we will see anything remotely as glorious as these images in LT1. I think we will probably be looking at something more like colonies. I hope the master coder proves me wrong. I suspect that "colonies" means the same thing as it did in Freelancer: cities. Or, to be more precise, a city that isn't supported by outlying towns; a self-contained city relying on imports from space. A "colony". And no, I don't expect to see anything quite this glorious in Limit Theory... but one can hope. And if we keep those images coming (hint hint), we could inspire him to even greater things. I think this falls under "immersion", and not entirely "graphics". Edit: Actually, we might see things this glorious (minus the last one) - they're all made up of standard shapes - spheres, cubes, cylinders, etc. The texturing would be the main issue, I think - but building cities ought to be easy. Talvieno wrote: I suspect that "colonies" means the same thing as it did in Freelancer: cities. Or, to be more precise, a city that isn't supported by outlying towns; a self-contained city relying on imports from space. A "colony". If Josh can capture the lively bustle of the major "colonies" we saw in Freelancer, Talvieno, I will consider his efforts a triumph. 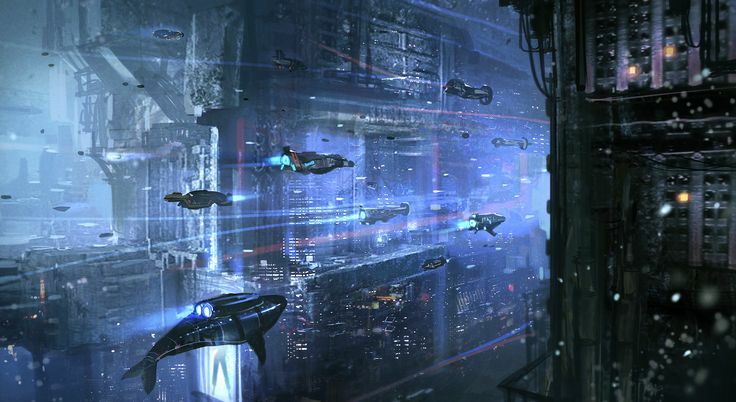 That's one of the features of the PU in Star Citizen I am really looking forward to seeing. Talvieno wrote: The big question is, how pretty will it be? Oh yes, pretty is a requirement. You know what I'm like when it comes to eye candy. I'd love for cities to dynamically reflect the conditions of the planet. If it's rich from a recent trade boom, shiny new buildings everywhere. If it's recently colonized, short squat houses in an unfamiliar atmosphere; maybe some greenhouses dotted around. If a massive battle just occurred overhead, I'd love orbital bombardment scarring on buildings and a cratered landscape- maybe even with little bits of battleships fallen from orbit.